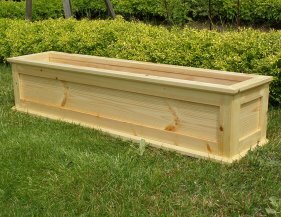 The Poyle Wooden Window Box is perfect for any window ledge, wall or fence. This frame style window box with its clean features is a handsome way to display your plants and flowers whilst looking good in its own right. 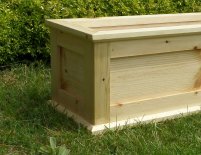 Poyle windowboxes are made from Scandinavian red pine with holes in the base for good drainage. The windowboxes can be finished in clear, golden brown, wild sage or white preservative. We also offer a selection of Farrow & Ball paint finishes. Prevention of disease begins when you must make sure that all your window boxes are scrupulously clean. New window boxes should not need any cleaning, but used window boxes should be washed. Wooden window boxes will need to be vigorously scrubbed, and treated periodically with a timber preservative that will not harm plants. This advice also applies to seed trays, small planters a any pots used to raise seedlings. Ideally, window boxes should be washed as soon as they are emptied so they are ready for use when needed. En accessories such as canes and labels carry disease and should also be disinfected before they are put in storage. and wipe the blades of your secateurs with a cloth soaked in disinfectant before moving on to the next plant. Bacteria and fungi can also be spread on your fingers, so remember to wash your hands from time to time while working in the garden. Never reuse old compost. Not only will it contain an imbalance of plant foods by the end of the season, but it may also harbour disease spores and bacteria, which will be carried over to the next planting.You can usually spread old compost over the garden or on the compost heap. However, certain diseases, such as tomato and potato blight, contaminate the soil so much that it is best to throw away any compost that plants affected with these problems have grown in. Always remove dead flowers and leaves, and any other unhealthy plant material as soon as you spot them. Clean the area around your, window boxes regularly, and never compost anything that you know to be infected. Like people, plants under stress are more vulnerable to disease than those bursting with vitality. Keep plants well fed to give them the best chance of survival. Fertilisers that are high in phosphates and potash produce strong root systems and tough, disease-resistant growth, while those with high levels of nitrogen can encourage lax, soft growth, which is easily invaded by diseases. 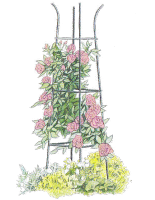 Under watering also puts plants under stress, making them vulnerable to disease, while plants grown in waterlogged window boxes will have poor root health and weak, sickly growth.